BitOrion: Earn Daily Bitcoin Profits From Crypto Trading Plans? According to crypto trader Brian Kelly, now is the right time to invest in Bitcoin Cash (BCH). The founder and CEO of cryptocurrency trading firm, BKCM LLC envisages an increase in the value of the most popular bitcoin fork. Speaking to CNBC, Kelly predicted an impending bull run for Bitcoin Cash. He based his assertions on the decisions reached during the recent meeting of Bitcoin Cash miners in Hong Kong. The miners agreed to set aside as much as five percent of the block reward for mining towards funding Bitcoin Cash development projects. That’s how blockchains gain value. You’re going to be getting more use cases to the extent that usefulness translates into value. That could be a positive for Bitcoin Cash. The BKCM CEO expects the increase in use cases of the Bitcoin Cash blockchain to drive prices up. With more utility on the blockchain, developers will be incentivized to create useful solutions that run on the network. Thus, Kelly thinks now is the time for traders to consider Bitcoin Cash seriously. 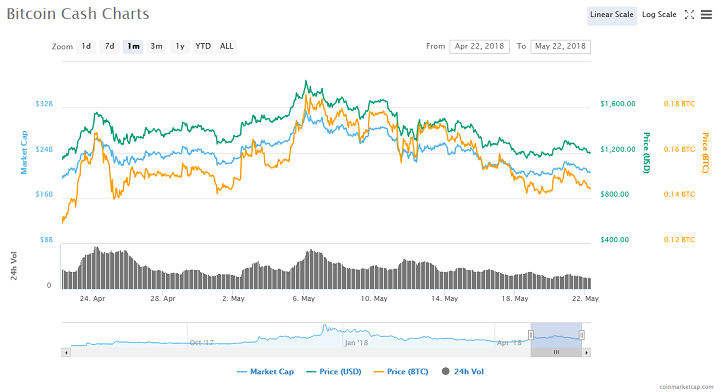 The crypto has surged from $760 in April to crossing the $1,000 threshold in May, reaching a high of $1,600 on May 6. The fund is aimed at supporting programmers who develop useful protocols on top of the Bitcoin Cash blockchain. During the meeting a few days ago, the top figures in the Bitcoin Cash community including Calvin Ayre and Roger Ver tabled discussions about the funding mechanism for the initiative. Apart from the percentage block rewards contribution, participants also agreed to a voting process to determine what projects to implement. The decision to adopt a treasury model for accruing donations for the development fund bears a striking resemblance to the one used by Dash developers. No decision has been made on the specific percentage to be used for the donations. However, a simple analysis shows that a one percent block reward contribution amounts to about $650,000 per month on average, provided Bitcoin Cash prices do not fall below $1,200. At the time of writing this article, BCH prices have declined by six percent in the last 24 hours. Do you agree with Brian Kelly’s analysis that more use cases will provide value for BCH thus driving prices upward? Will the Bitcoin Cash Development Fund initiative lead to the creation of intuitive protocol solutions on the BCH blockchain? Let us know your thoughts in the comments below. Image courtesy of CNBC, CoinMarketCap.